Submitted by PeterDarby on Tue, 07/02/2012 - 13:36.
he Popham event is over three days with the classic car day on the Bank Holiday Monday. We were there for the three days last year but due to windy weather the Microlites etc. were unable to land Saturday and Sunday. On the Monday although it was still windy and not very sunny the field was filled with classic cars, autojumble and walking visitors. Our stand was very very busy on the Monday and only managed to run down to take this photo of the Messerschmitts on the field, which totalled eleven cars. 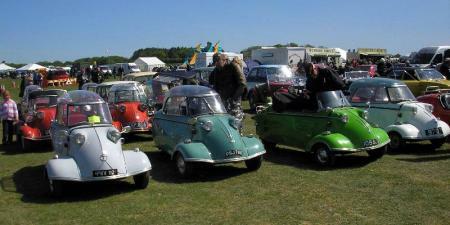 The Popham event this year is Monday 7th May 2012 for the classic car section. We are issued with a limited number of tickets for the cars and these can be obtained from me (Peter Darby 01183 778174) but only on request — if you do not book one then there will be no ticket. There are no other microcar stands but usually plenty of autojumble. Come and join us — you will enjoy it. Come early as traffic into the airfield is known to be bad at showtimes. See you there!